This week's giveaway is from Aliya of Plays Nicely With Paper. She is giving away this adorable set of cards. Contest ends Saturday, June 9th, at 12:00 noon Central. One winner will be chosen by Random.org. 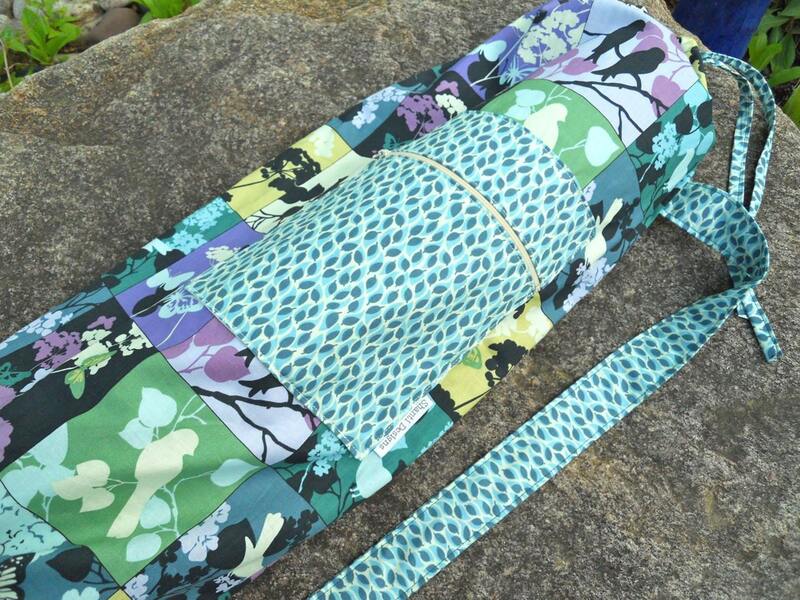 This week's giveaway is from Ann of Annrocks Apparel and is giving away this hip fanny pack. 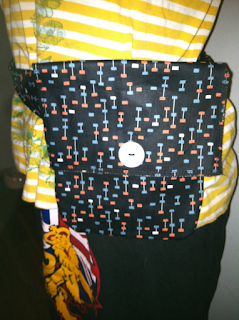 Ann created this Hip Hands-Free Fanny Pack with cool black vintage fabric and a pretty vintage button. It has a strong velcro closure to keep everything in place when you wear it. The fanny pack has an adjustable waistband and can be worn as a sling. It is lined in the same fabric and finished for strength and durability. The fanny pack fits size 6-14. 7. Become a Facebook Fan of Ann Rocks. Comment back here with your Facebook name. Existing fans just leave your Facebook name here. 8. Contest ends Saturday, June 2nd, at 12:00 noon Central. One winner will be chosen by Random.org. 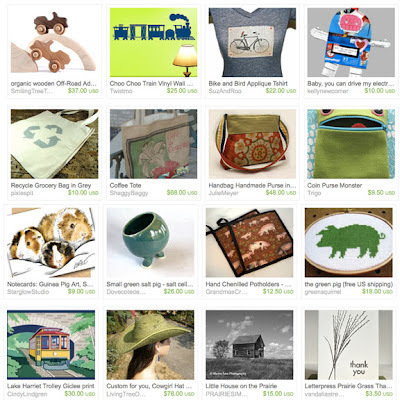 HandmadeMN Fun Friday Finds ~ Road Trip! School is almost over so it's time to start planning your summer road trip. Here are some road trip and travel related items that the HandmadeMN team members have created. Having fun! Wish you were here! The energy and creativity of Renee Dittrich, NostalgicSummer, is endless. 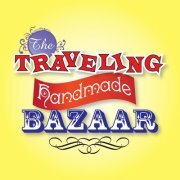 Her latest endeavor is organizing and managing a Traveling Handmade Bazaar! Renee has engaged a number of artists and crafters to participate in the bazaars. Each bazaar will be fresh and unique and will feature different artists and crafters depending on when and where the event takes place. Renee is proud to announce that the first event will be held at The Bean Coffee & Wine Cafe in Andover on Monday, May 21 from 5:00 to 9:00 pm. You will be able to shop for handmade jewelry, art, candles, kitchen decor and other treasures while enjoying some supreme refreshments. The Bean will be offering wine and appetizer specials to all of its customers! What a way to start your week. Additionally, you will find palm wax candles from Palm Tree Candle Company and handmade creations from Karla Mae Scrap Book and Art at the event. Happy Mother's Day! And congratulations to our latest giveaway winner! Thanks to all who entered and we wish you good luck with this week's giveaway! This week's giveaway is from Cindy Lindgren. She is giving away this beautiful giclee print of Poppies. With Memorial Day coming up, Cindy's giveaway is extra special because poppies remind us of veterans and their service to our country. This spectacular print is an 8x10" giclee print of Poppies that were hand drawn by Cindy. It's a high quality print that resembles a silk screen with its rich flat colors on archival fine art paper. It has a tan border and is ready to frame. Contest ends Saturday, May 26th, at 12:00 noon Central. One winner will be chosen by Random.org. 2. Blog about this giveaway with a visible link back to this posting andcomment here with a link to your post. 7. Become a Facebook Fan of Cindy Lindgren. Comment back here with your Facebook name. Existing fans just leave your Facebook name here. 8. Follow Cindy Lindgren on Twitter. Comment back here with your Twitter link. Existing followers just leave your Twitter link here. 9. Follow Cindy’s blog. Leave a comment here letting us know you are a follower. If you are already a follower, leave a comment anyway, as each comment is an entry. Fin Friday Finds for Mom! 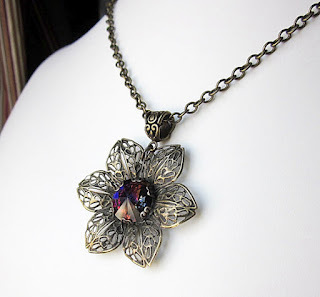 This week's giveaway is from Amanda Kloster of Beatific Bijoux who is giving away this romantic Floral Pendant Necklace. 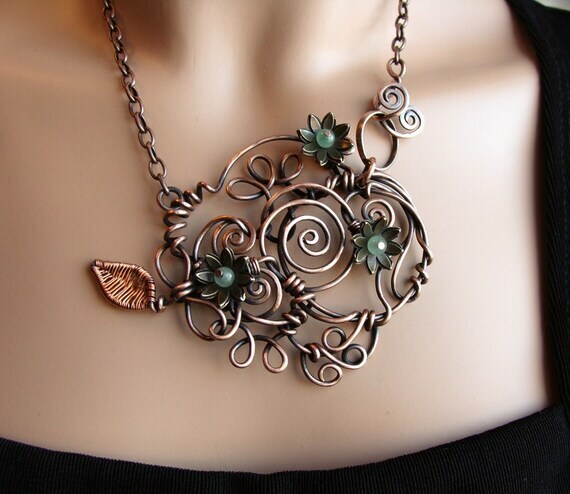 This romantic necklace is so eye-catching! 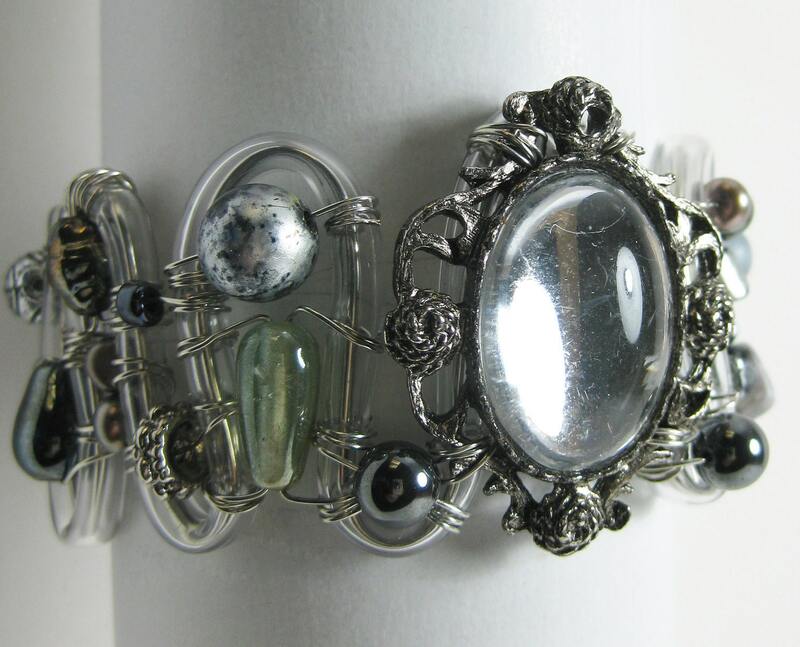 A gorgeous, flashing faceted Swarovski Crystal is the focal of this piece. It displays all colors of the prism in brilliant, mesmerizing flickers. It's a fantastic color play even in low light! The crystal is set in a delicate, lacy six sided daisy filigree in antiqued brass. It's really amazingly lovely. 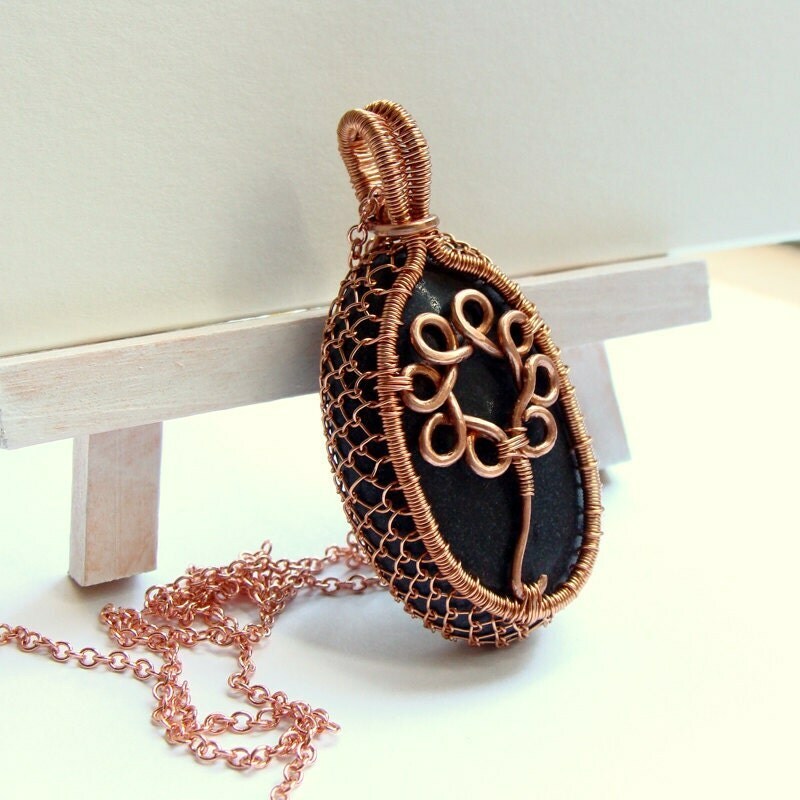 The flower measures 1.75 inches in diameter and is mounted on a heavy oval-linked chain and finished with a large lobster claw clasp.The chain measures 18 inches (46 cm) in length. 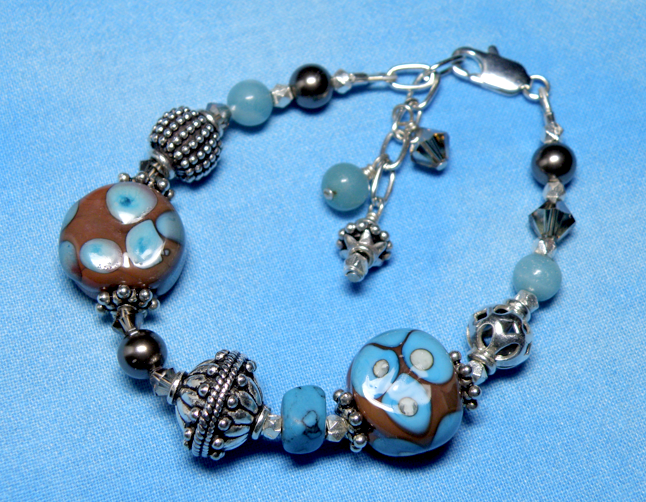 Visit Beatific Bijoux, pick your favorite item and leave a comment on this post about it. (Scroll to bottom of post and click on Comments) Please make sure you include your email address so we have a way to contact the winner! 7. 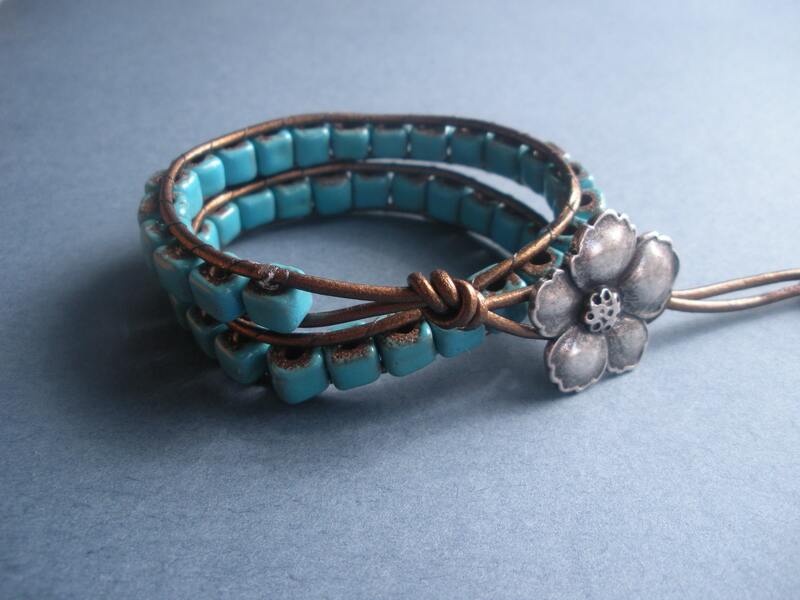 Become a Facebook Fan of Beatific Bijoux . Comment back here with your Facebook name. Existing fans just leave your Facebook name here. 8. Follow Beatific Bijoux on twitter. Comment back here with your Twitter link. Existing followers just leave your Twitter link here. 9. Follow Amanda's blog. Leave a comment here letting us know you are a follower. If you are already a follower, leave a comment anyway, as each comment is an entry. 10. Contest ends Saturday, May 19th, at 12:00 noon Central. One winner will be chosen by Random.org. What is that saying? Oh yeah! "A picture is worth a thousand words." Well, today you get the pictures of our SWAG Bags and Giveaway Baskets for our Spring Market on Saturday, May 5 - that's tomorrow! The SWAG Bags will be handed out at both the front door and the back door. Lines do form well before our 10:00 start time. Here's our line from our 2010 Fall Market. Our Giveaway Baskets are better than ever too! You are entered to win when you turn in your completed Passport. Pick up a passport when you arrive. Have 3 vendors from upstairs and 3 vendors from downstairs stamp your passport. No purchase necessary. We will have 2 very lucky winners. They are overflowing with goodies!! Fun Friday Finds — It's Spring Market Weekend! 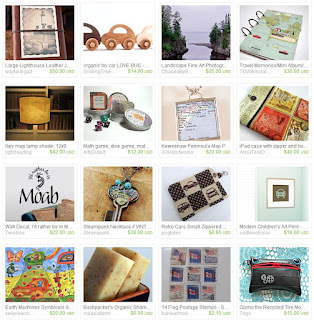 It's always a treat for me to peruse Etsy for the artists and crafters that make up the HandmadeMN Etsy Team. We have a lot of members and I'm often surprised when I come across a shop I've not seen before. Sparkflight is one of those shops. 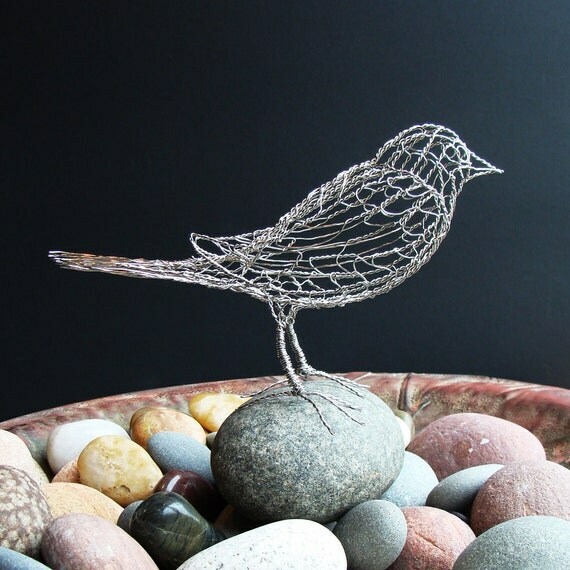 If you're looking for a one-of-a-kind swirly, twisty, breath-taking piece of wire art, take a look into Sparkflight. You'll not be disappointed. 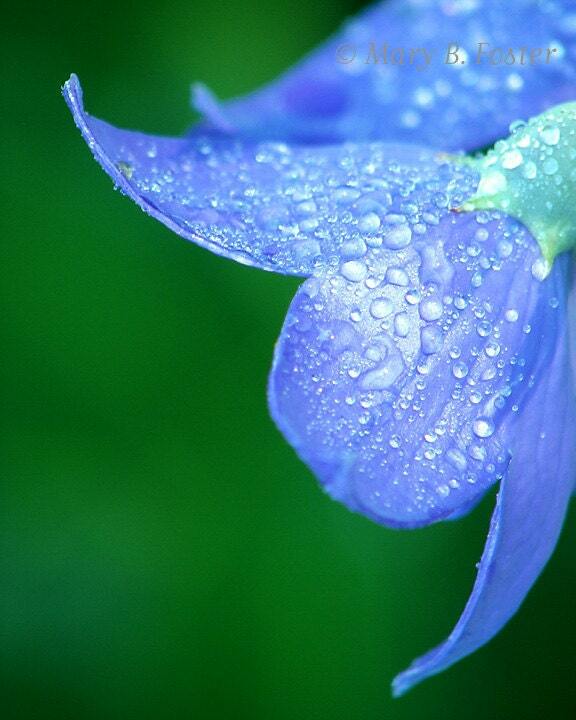 This month's challenge theme is Spring Showers.